Swimming – My Happy Pace! I must admit that I am quite sad to leave this job. I have been working here for the past 6 years, which has been my longest stretch at one place. Before that my longest was 3 years. I have met some amazing people and have learnt a lot. People have had confidence in me and I have changed positions in the company a couple of times with my latest one being Compliance Liaison Manager, a position I enjoyed and nothing like I have done before. But, I am also excited to leave. Although it was not my choice it is most definitely time. I have known for a while that me working full time and Little OL being at the school she is at just does not work. The days are too long for her if left in After Care and although I could fetch her at lunch and take her home which I have been doing for the past few months it is far from ideal. So, today is a mixture of happiness, sadness and excitement. Another chapter begins! 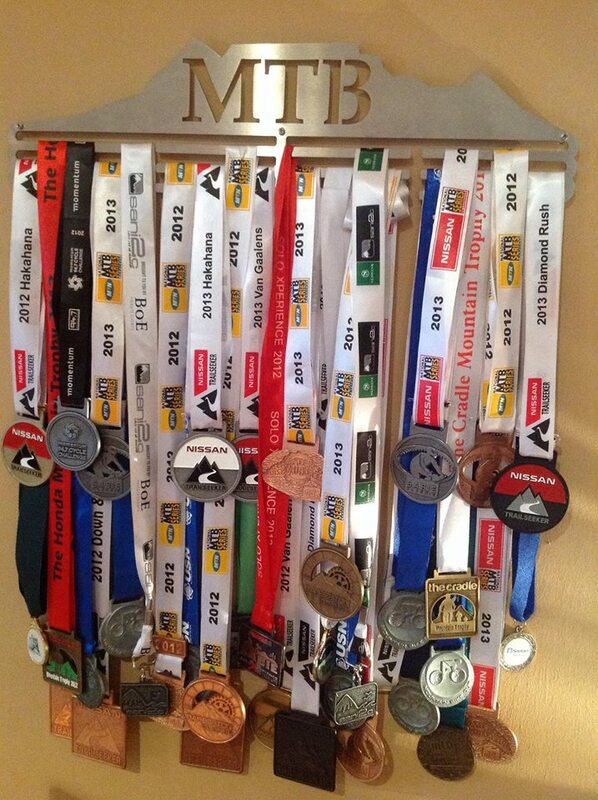 Here are a few photos of customers hangers that they have sent me. I love seeing them! 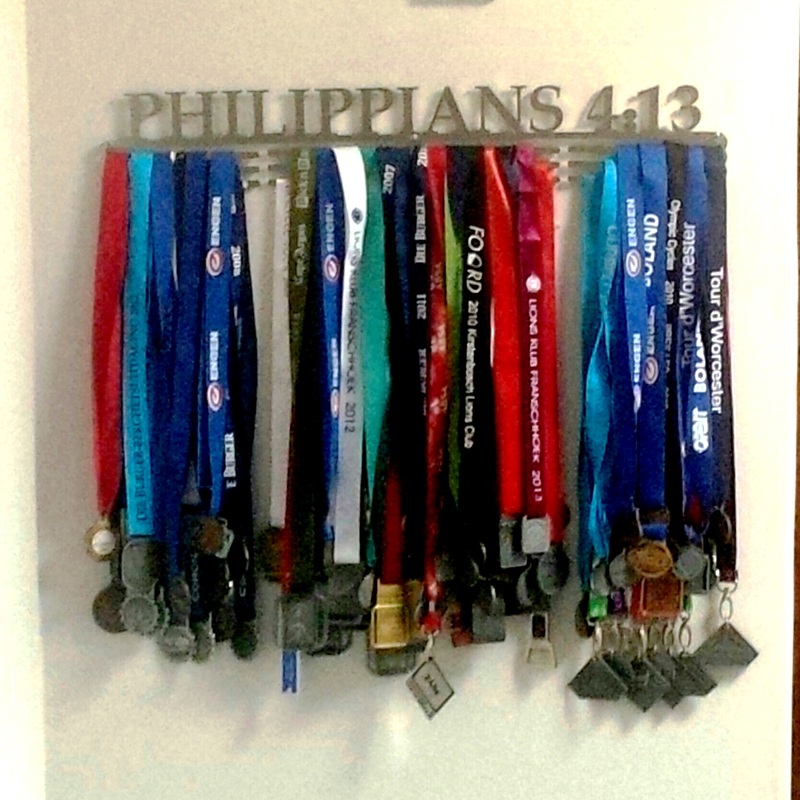 SA Medal Hangers – I LOVE MEDALS! 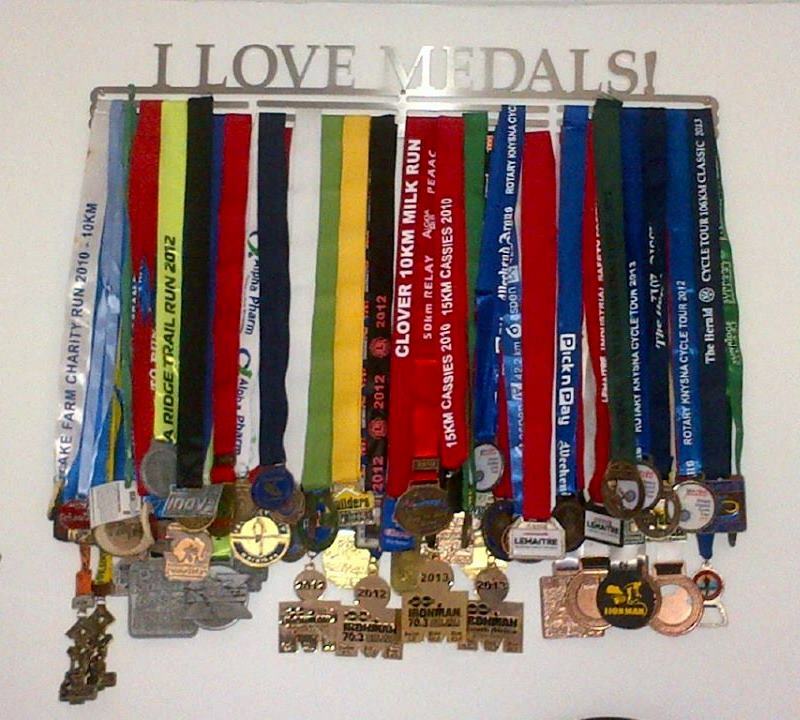 And I agree – I lOVE MEDALS! I am not very good at writing race reports but here goes – I finished in 7:33:45 and I am very, very happy. At least this year I actually got to the start line and finished. A big step up from last year. I have realised that I am very lucky when it comes to Ironman races. I have yet to have a puncture or a serious technical malfunction, both of which could end my race. I did however have a few minor issues, but none of them were race threatening, more of an annoyance. My bike computer gave up on me at about the 10km mark – it kept telling me I was doing 14 km/hour, which was fine, except I was going down a hill and it fell more like 41km/hour. When I got to the turn-around point I actually turned if off; it was more of an annoyance than a help. I then tried to calculate my time to transition based on my watch time. My Garmin also stopped reading distance after the swim, giving me only the time. Thankfully that was enough on the day. I heard later that two men died on the swim. It is very sad, imagine your son, father or husband (or wife, mother, daughter) goes off to race a triathlon and does not come back. Chances are you are also going to be there watching. It must be devastating and my thoughts are with those families. The Bike – besides my bike computer not working I had fun. It was not nearly as bad as I expected, and although I could have done without the headwind we faced heading back I enjoyed it. I was so happy to reach the turn-around in a decent time that I burst into tears. I knew that that bar any issues it was do able. My only other problem in the bike was my sunscreen got into my eyes and they started to burn (probably because of the tears earlier). I could not see a thing and it looked like I was bawling my eyes out. Luckily it happened near the end and just before the horrid hill everyone was telling me about. I think it distracted me as I did not notice the hill. I guess not being able to see can do that to you. Then the run… The whole time I had been thinking – as long as I can get to the run I’ll be fine. Well I got to the run and it SUCKED! I just could not run. My legs just did not want to run – they wanted to walk. It was hot and I was tired. I think I must have pretty much walked the whole 1st 10km. Luckily as I passed the 11km mark everything seemed to click into place and I started to run again. Besides Bunkers Hill (which is not nice) I pretty much ran the whole of the last 10km and I loved it. I finished on such a high, and was smiling and happy, although if I look at the finish photos my sister-in-law took I don’t look that smiley. I look like “where the hell is the line”, but at least my hair looked good (not). And few seconds after I crossed the line the tears started again. So as I a round up – I loved it. I will do it again! Can I say that I will train more, nope, probably not? I am very happy with how this race went considering my serious lack of cycle and swim training, who knew that muscle memory is there. I do think that the trail running has helped a lot though. So to everyone that supported me and cheered – at the side-lines or from afar, thank you very much. I really appreciate it! It means a lot to me. Ironman 70.3 is next weekend and I am not going to lie, the bike cut off is going to be a bit tight if not damn near impossible. I have not cycled nearly enough (when do I ever?) and I have done ZERO hill training. Yikes. Here is a quick breakdown of my cycle uhhh training (cough). I have done 10 or so training rides on the roads, only one of which was slightly longer than 60km – but not much…. The rest were all about 45km. I have only done one ride that included hills (4 small hills to be exact) and a few rides (half hearted) on an indoor trainer. 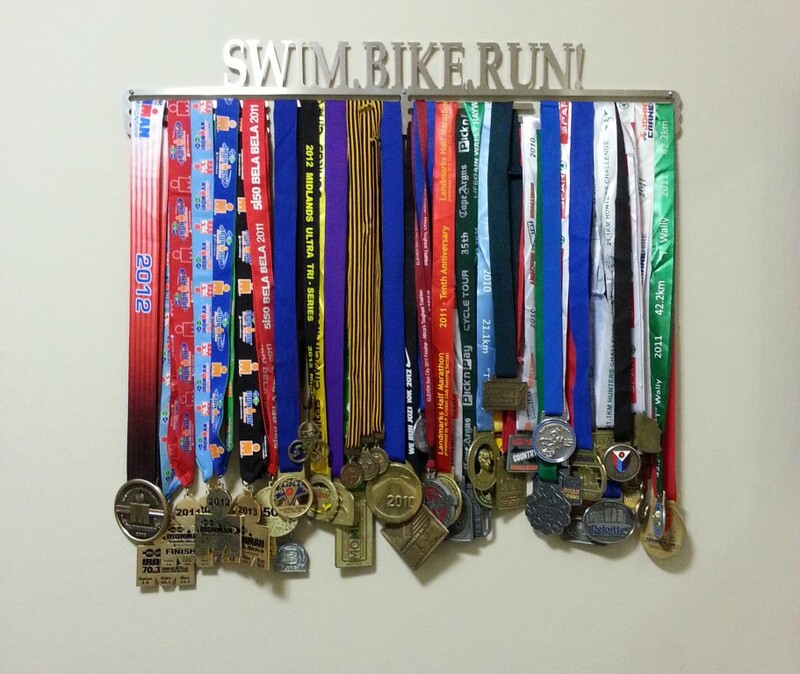 I have also done 3 triathlons (sprint distance….). Those of you who are also doing the 70.3 or who have done it in the past can stop rolling around on the floor laughing please. Will I finish Ironman 70.3 in East London – I sure as hell hope so. For some strange reason I am more confident going in this year than I was last year. Not sure exactly why though – I think it is due to the fact that I have not had the opportunity to realise just how bad it actually is going to be. Last year I rode a lot more, we did a lot of hills and I knew it was going to be tough – this year I am relying on muscle memory and a strong mind. Last year though I only rode – I did not do much running or swim training. I had not done many (any) sea swims. This year, as long as I can actually get to the run, I should be fine. In fact my main goal for this year is to start the damn race! So – this time next week we, along with loads of other nervous and excited athletes will be heading to East London. I cannot wait! Please wish me luck if you see me, unless you have a sniffle – then please stay away…. I am not saying I am not competitive, I am although it might not seem that way. I don’t win, I usually don’t even place. In fact I have been known to be dead cold stone last! Yip, prize giving has been held and I have walked run across the line. But I do check my results, I watch my time and I have been trying to get faster this year (it’s worked). But that is not my main reason. I just like to take part. However 2012 did not start well. 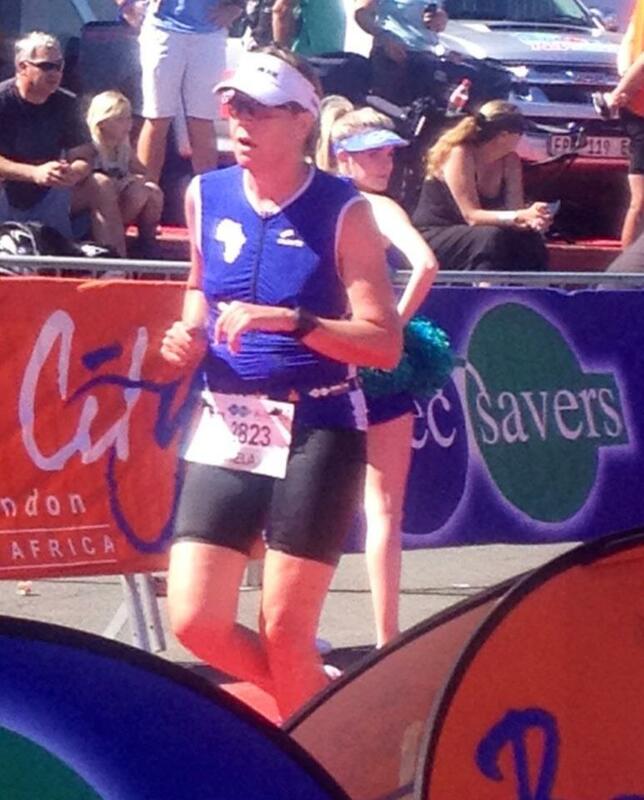 My first big race was Ironman South Africa 70.3 in East London. I got sick 2 days before the race and decided not to do it. A DNS. It was disappointing, but not as much as most people (myself included) believed it would be. My goal for that race was to get back into training, and I did that. So whether I did the race or not I achieved my goal. I decided to withdraw a month before the Baviaans Trail run as I did not feel I would be ready. Thankfully the smaller races went well, and I have enjoyed training. One of my favourites is definitly the Urban Run. I have also rekindled my love for trail running. I did quite a few of the local trail runs, with quite a few of them being longer than 20km. I have also enjoyed the 10km road races I have entered and have seen my speed improve. Also my 21.1km time is almost on par with what it was before I had Little OL and I am happy with that. 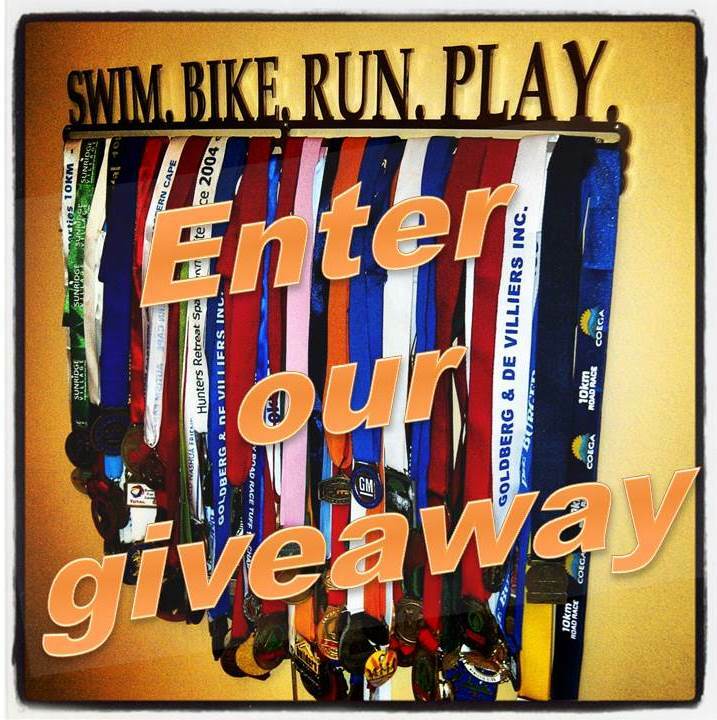 I have entered a few triathlons which have been fun. The first one of the year was the Corporate Triathlon the day before Ironman South Africa. We had stunning weather – unfortunately for the Ironman competitors it had changed by the following morning. Although I have not done as much open water swimming as I would have liked to have done I am happy with how it is going. The last event of 2012 was on 31st of December being the inaugural Mandiba Bay Mile swim from Humewood Beach to Kings Beach. The distance according to my Garmin was actually 1.94km and I completed it in 39 minutes – which came as a total surprise to me. I just hope I can repeat that on the 20th January when I attempt to do Ironman South Africa 70.3 again. I could not have hoped to end 2012 of on a better note. I would like to thank all the people that make such an effort to bring all these events to PE and surrounds, I for one greatly appreciate it. Sporty or active residents of Port Elizabeth and surrounds (and those visiting over the holidays) have NO reason to complain that there is “nothing to do”. In fact the list is so extensive you actually now have to pick and choose. I have decided to compile a little list here just to highlight exactly how much is going on in PE over the next month or so. And these are only the ones that I know about. If you have an event in the area over the holidays you can let me know and I will add it to the list. The races are sprint distance – so 750m swim, 20km cycle and a 5km run. It can be done as an individual or as a team. There is also a run, swim run event which will be held at Port Elizabeth and Pollok Beach events. Held every Thursday night at 6pm, run as many loops of 2.6km as you can in 60 minutes. An informal training run in Baakens Valley starting at Bridge Street, meeting at 5:15 – 10km. Every alternate Sunday at Hobie Beach –starting again on 13 January 2013. Held in Marina Martinque with various distances from 25km (ouch) to 500m. There is more information on their website with regards to the different distances. Held every Thursday night, ride as many loops of 3.1km as you can in 60 minutes. Starting at 8:00 am and held in conjunction with Masters and Ladies Cycle club, there are various distances from 12km to 30 km. Facebook pages to like if you want to keep informed of events in this area. Here are two more pictures from the weekend. The first one is of me throwing Little OL as far as I can in the pool. She loves it! If you look carefully at the photo you will see that, at that point, only her feet are in the water. She goes right under and comes up laughing. I love the fact that she loves swimming. The second photo I just like. Relaxing at the Beacon Isle pool. I am happy! I am not sure if it is because I am training lots, if it is because I hired a life coach and I am seeing the results, if it is because of the 30 Days of Gratitude, if it is because it is summer or most probably a combination of all of these but whatever it is long may it continue! This weekend definitely added to my “happiness” feelings. A while back I decided to take Friday off. I could not get my regular hair appointment; the only one available was during working hours, I booked it anyway. After I booked it I was wondering how to go about getting the time off and then decided to take the whole day and do a total pamper spoil day, something I have never done before so I booked myself a pedicure and massage as well. Ahhhh – the joys. My biggest problem was ensuring I kept my toenails (running and toenails are not good friends). The day was awesome – not that I will have much leave left after January, but this is something I will do again. Then on Saturday the OL family took a trip to Plett for breakfast. A really good friend and her family was visiting from the UK so we met them at the Beacon Isle Hotel. It was stunning – we ate breakfast and then headed to the pool for the rest of the morning. I could have stayed there for quite a while longer. We used to go to Plett often growing up and it is one of my favourite places – definitely a “happy place”. The last time I was there was when I was pregnant and we went to see the same friend. Between us we now have an extra kid each. But it was still like we saw each other not so long ago – I miss her. You can see photos from the last time we where there over HERE. On Sunday morning I met a friend at Hobie Beach for a quick ride before we took part in the Ocean Race Series swim. It was my first Ocean Race Series swim of this season and I was reasonably happy with the results. It was supposed to be 1 km, but according to my Garmin it was about 1.53km (some of this extra was probably down to my zig-zagging but not all) and I did it in 29 minutes. If I swim that pace in East London at the 70.3 I will be fine. All this beach, sea, sand, pools and sun has got me feeling like it is summer holidays. One more week of work. I cannot wait!!! For the past few Sunday’s I have been taking Little OL swimming at the gym. She took to it like… well, like a “little mini me” to water. Have a mentioned that I LOVE swimming? How do you explain a Wonder Bra (with extra padding) to a 2 year old?? ?